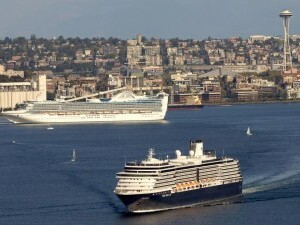 Seattle cruise port is divided into two distinct areas, with Smith Cove at Pier 91 the home port for ships belonging to Carnival, Princess, Celebrity, Holland America and Royal Caribbean. At just 10 minutes from the heart of the vibrant downtown, the Space Needle and the Pioneer Square, there is no better place to start your Alaskan adventure. If you are a passenger on any number of the Alaska cruises from Seattle, chances are you will depart from Pier 91, located at the north end of the beautiful waterfront. Pier 91 is loaded with amenities for the cruiser with rental car kiosks, luggage storage facilities and a free parking lot for those being picked up after their cruise. If you want to leave your car at Seattle cruise port, they have a secure 1000 space lot available exclusively for cruisers with rates that start at $26 a day. (Save $1 per day if you book your space online prior to departure). There is a free shuttle to take you from your car back to the terminal to catch the ship. Cheap cruises from Seattle are popular, but where do you stay beforehand if you are not within driving distance of the port itself? Several local hotels offer cruise and snooze packages, some, like the Fairfield Inn by Marriott offer free shuttles to and from the airport and the cruise terminal, and a room with rates starting at just $159. Likewise, the Holiday Inn offers airport/hotel/cruise terminal transfers and rooms starting at just $139. If you need to leave a car, there are hotels that also offer parking in their snooze and cruise packages. The Towne Plaza Suites offer up to 14 days of parking, your room for a night and shuttle to the Seattle cruise port all from rates that start at just $99. The Sutton Suites offer 7 days of parking, the room and shuttles with rates starting at just $90 and that also includes breakfast, so you arrive at the ship refreshed and invigorated. Seattle is a city with so many things to do, and offers a spectacular waterfront view, something that can be appreciated best from the water with an Argosy cruise of Seattle Harbor tour. Tours can be as short as an hour and take you on a loop around the harbor allowing views of two mountain ranges, the city before you and the colorful harbor itself. Argosy also offers lunch tours that are longer in duration but that make for great sightseeing trips either before or after your main cruise. These tours originate at Pier 55, not far from the Seattle cruise port itself. While many partake in the cruise deals from Seattle, the city itself is a lovely destination to check out pre or post Alaska adventure.